Newly married Barbara Brouker found herself in unfamiliar territory when she and her husband, Roy Rawson, moved from her Berkshire County hometown of Pittsfield, Massachusetts to the neighboring rural town of Richmond in 1949. The two communities were only eight (8) miles apart, but they might as well have been 800 miles apart for this city girl, new to farming life. In Richmond, the energetic young couple ambitiously purchased eighteen (18) acres of prime farmland on which rested a cozy house squarely placed between a bustling poultry farm on one side and a thriving apple orchard on the other. This homestead became the foundation from which future Master Gardeners Barbara and her daughter Liz (Leonard) grew their intimate, lifelong connection with gardens and herbs. It was the Victory garden in particular, as kitchen vegetable gardens were called in World War II days, that launched Barbara on her journey with plants. Soon after moving in, Barbara and Roy got busy planting what she called a “small” victory garden, approximately 40’x20’. Plentiful green, airy asparagus and many other stock cooking vegetables thrived in it, well-fed by a steady supply of chicken manure from right next door. Abundant fruit soon joined the vegetables in the form of ruby red raspberries, sunny peaches, and brightly skinned nectarines. Living close to the land agreed with Barbara and became part of their family fabric when her daughter Elizabeth came along. According to Barbara, Liz “learned to garden in the womb”. Right from a toddler, Liz loved the garden, the soil, and everything about the plants. “She was always at her father’s heels,” as he went to and from home and his work at the poultry farm with Liz riding happily on the wheelbarrow he pushed between the two locales. “It was a wonderful way to grow up,” beamed Liz as she fondly remembered her childhood years. It was a lavender plant gift from a friend in the late 1970’s that opened up the world of herbs to Barbara. She planted it, it grew, and Barbara never looked back. By 1982, those aromatic and savory plants captured her imagination so much she designed and planted a formal herb garden, starting the formation with a stone gate post as the center point and extending wedge-shaped garden beds out from it, like the petals of a starflower. Inspired by the multitude of fragrances and flavors growing in her gardens, Barbara began dabbling with herb-inspired recipes. By around 1985, she and Liz started an herbal products business, selling their wares at local craft fairs and farmers markets. Fortuitously, in 1988, she learned of the Berkshire Botanical Garden (BBG) Herb Associate program through a friendly conversation with a program member who told her about both that organization and the Master Gardener (MG) program. Barbara eagerly dove in and became an Herb Associate herself, keeping the MG program in the back of her mind. When she first started at the BBG Herb Garden where the Associates met, “The (other members) arrived and had tea and I arrived with a shovel!” she laughed. Barbara worked in BBG’s Production Herb Garden, growing and tending to the plants used by fellow Associates in their Kitchen and Drying rooms to make delicious products to sell, and diligently helped maintain the BBG Display Herb Garden, enjoyed by thousands of BBG visitors annually. She is very proud of those gardens and is a dedicated Herb Associate through and through to this day. BBG relocated and renovated its herb production garden in 2017, causing a pause in the Associates’ work. Now, in 2018, that change is complete and Barbara, together with her fellow Herb Associates, is ready to get back at it. After a few years with the Herb Associates, Barbara turned her attention to the Master Gardener program and in 1995 she decided to make the plunge into her now 23-year run with the Western Massachusetts Master Gardener (WMMGA) organization. She enjoyed WMMGA right from the start because there was always something going on. One early WMMGA experience in particular brings a smile to Barbara’s face. A key rite of passage for Master Gardeners is taking an intensive education curriculum over the course of four (4) New England winter and early spring months that culminates in “The Exam”. These classes are held in Hampshire or Hampden county, well East of the Berkshires where Richmond lies. Barbara fondly remembers bonding with fellow MG interns Ike Crawford, Duncan McQueen, and Carol Maynard, as they motored together to and from the often snowy Berkshires, reviewing course notes, lamenting the upcoming exam, and chatting happily amongst themselves. She still has her MG Final Exam. There were 25 multiple choice questions and 10 matching ones. Those treks and talks continue to this day with each new intern class. Having worked side by side with Barbara since she was a young child learning about vegetable gardening, growing fruit, and catching the love of herbs, Liz decided to also apply for the Master Gardener program. She passed the interview and, in 2011, found herself as a Master Gardener Intern, much to her delight. This made her and Barbara the first, and still only, WMMGA mother/daughter pair. Living near Barbara and being a Pittsfield resident herself, she dove right into the WMMGA’s Berkshire projects. In that first year, she volunteered for the Berkshire Symposium where she and Barbara together taught a class. She soon expanded her WMMGA efforts and in 2013 became the point person for MG Interns volunteering at the BBG Herb Garden where new interns still benefit from her tutelage. Liz also loves working on the BBG Hotline with Laura Dumouchel. The two of them took on the Hotline starting in Spring 2014. Barbara worked on this gardening support project in the past, too. She still talks of how she would promote the hotline by taking yellow cards advertising it around to local businesses and farmer’s markets. This grassroots marketing worked well for them, bringing in calls from across Berkshire County. When asked about their thoughts regarding WMMGA, both commented they appreciate how the MG training is continually improving and overall demand to enter the program is increasingly strong. They are also happy about the formation of the Marketing Committee. Barbara in particular hopes its efforts can be used to help “make holes in the mountain”, both the literal and figurative mountain between WMMGA’s Berkshire, Hampden, Hampshire, and Franklin county groups and work to unify the areas. Barbara thoughtfully advised the newly graduated Master Gardeners to not do everything at once. Just because there is a big room does not mean you have to fill it. Work on 2 or 3 projects and remember that one does not get everything done immediately. No matter what, “You will always learn something,” she enthused. Adding to that, Liz strongly encourages the new MGs to volunteer for something and participate in a meaningful way. If everyone does a little something, much gets accomplished. She enthusiastically encourages them to just do what they love. Barbara enjoys staying current with MG activities by attending meetings as she can and reading the weekly MG e-mail and the Grapevine, both of which Liz prints out for her as she no longer uses e-mail herself. 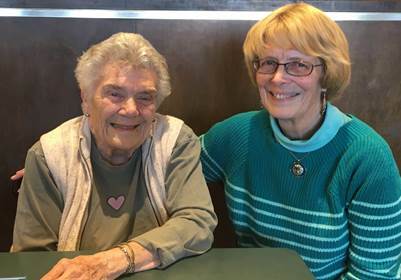 Both Barbara and Liz have made long-time Master Gardener friends whom they treasure and for which they are ever grateful. The MG organization does not stop, it evolves. These two Berkshire County natives are eager to watch and participate in WMMGA’s development. It has been a wonderful experience for them both and they hope the new Master Gardeners will find it so, too.